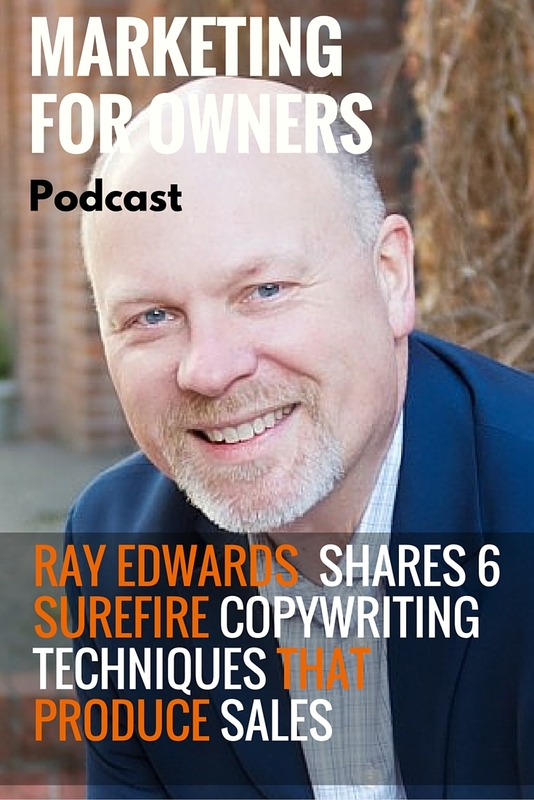 Ray Edwards is probably the highest paid online copywriter. And he’s been a fan of copywriting since before he even knew what it was. As a child, he’d read the adverts in the newspapers instead of the actual news. Plus he enjoys reading the junk mail you throw away and the infomercials you change the channel to avoid. It’s that level of enjoyment and love for his craft, which has inspired him to become the expert before you today. After being in the radio broadcast industry for over 30 years, good communication became second nature for Ray. It was a long time before he took any formal copywriting education. Instead, he read books written by great authors. Robert Collier, Claude Hopkins, John Capel, Dan Kennedy, Jay Abraham, and John Carlton were his education. He then enhanced his knowledge with a correspondence course, so he now knows everything that’s worth knowing about Copywriting. His book ‘How To Write Copy That Sells’ will teach you everything so that what you write makes you money. This book means you haven’t got to spend the $250,000 and 30 years to be a fantastic copywriter. Ray saves you that effort and gives you a head start. But before you go off to buy his book, stick around and get a little taste of what he has to offer. Communication never changes, only the medium we use. And nor does human psychology. Even though some of the authors listed above which Ray learned from wrote their books a hundred years ago, they’re still useful and relevant. At its heart, copywriting is just storytelling. And when you break down the message into smaller components, it becomes discreet and woven subtly into the story. It’s just like the Hollywood blockbusters we enjoy. They get made using the same formulas. And once you’ve recognized that, you then predict the film. Who will die, who will save the day, and even what characters are going to say. Just try to not ruin the film for everyone else. But it’s the same for copywriting. You can often tell at what stage of the copy you’re at and what was coming next. All you need to do is tell captivating stories. This has been part of the fabric of mankind for millenniums, and always will be. 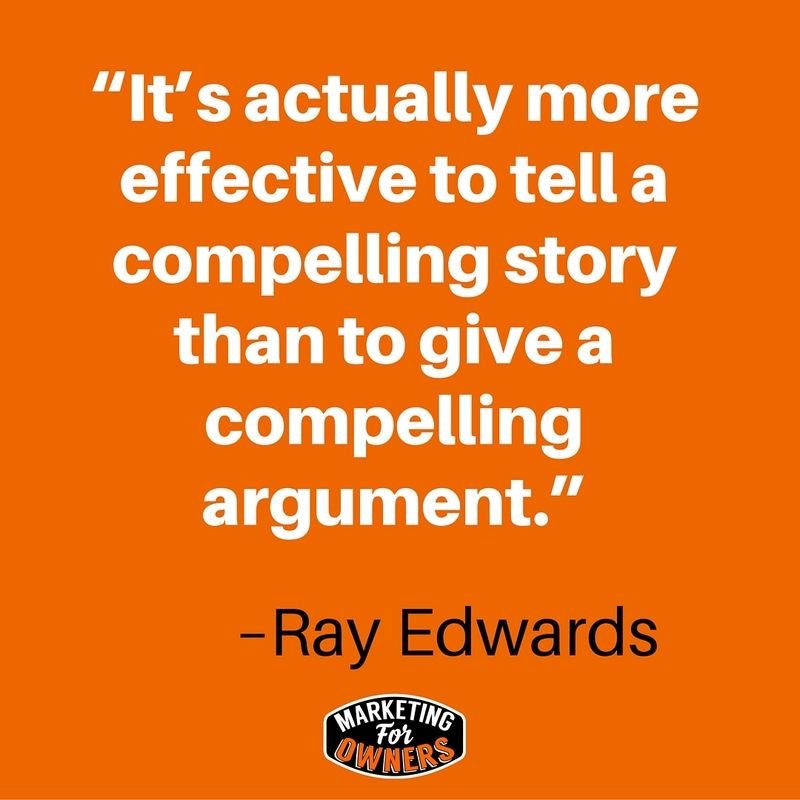 After all, it’s actually more effective to tell a compelling story than to give a compelling argument. Listen up, because you will likely find that you’re guilty of this error. It’s easy to make and you probably do it unintentionally. You need to ensure that everything you write is from the viewpoint of the customer, rather than yourself. The excuse is that you know your customers because you are their market. Well, if you ever say that to Ray, he’ll probably laugh. That isn’t the case. You are not your market because your customers are not in the business of selling to your market. I’m sorry to say it, but you are not one of them. Of course, you’re probably very similar. But not the same. And if you continue to write ‘we’, ‘us’ and ‘I’, you’ll continue to put yourself outside of the box and your customers won’t be listening. It needs to be about them to keep their attention. Customers are always asking ‘What’s in it for me?’ So make sure you’re telling them. 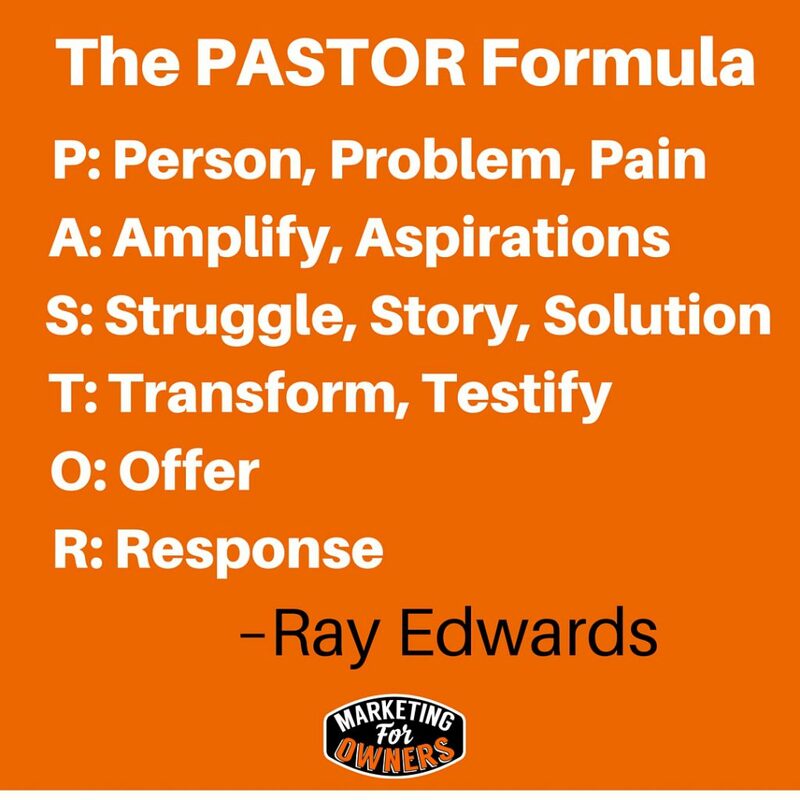 Ray calls this the P.A.S.T.O.R formula. By using it, you can care for your flock and direct them towards making a good decision. It’s irrelevant if they buy from you or not. You have helped them make a decision for themselves. But with this type of approach, you’ll naturally attract people who will buy anyway. As you may have guessed, it’s an acronym comprising of the following 6 stages. This relies on you knowing exactly who your customers are. That way, you not only know what their problem is, but also language they use to describe their pains and feelings. Without that, you cannot connect with them on the most persuasive level possible. At this stage, you stress the worse possible consequences of what will happen if their problem remains unsolved. This isn’t selling from fear, but rather from reality. They may not like to hear it or are accepting of what you say, but you’re being honest. You don’t want them to stay in denial. Don’t forget to also talk about what they can achieve as a result as well. Tell a true story. And the most powerful story you can tell is your own. They will be able to relate to what your pains and aspirations were. This puts you both on a level footing, and they can see that you obviously have the answer. This is when you show them the proof. Give them the chance to hear testimonies from other people who have solved the same problem. This is what a large proportion of infomercials do well with their real people talking, showing a before and after picture. Talk to them about what you’re selling. But rather than focusing on the product, discuss the transformation. No-one is looking to buy your DVD. But they are looking to solve their problem which your DVD happens to remedy. This is when you ask them to buy. Despite being the important step which validates everything else, it is often the weakest part. Whether it’s because we’re told to not speak to strangers, or ask for money, or are just scared of rejection, you need to do it. If you have something which is going to help others, then it is your responsibility to tell them about it. Otherwise, they are stuck learning to live with their pain. In the end, it’s up to them whether they solve the problem or not, so just give them the opportunity. And if you don’t believe in the product enough to do that, why are you even trying to sell it to them? The P.A.S.T.O.R technique is exactly how Ray does his own work. And he isn’t the highest paid online copywriter for no reason. But this formula doesn’t just apply to the sales letters it was originally written for. You can use this for every form of communication. Whether it’s an email, blog post, podcast, video, or sales pitch is irrelevant. It’s just storytelling. Whichever method you use to tell that story is up to you. In fact, the expert podcast interview you have/are/will listen to, follows this framework. And unless you know, you’re oblivious to the fact you’re in a framework. It just sounded like a normal conversation, didn’t it? Why? Because it’s just storytelling. And all communication is persuasive. Whether you’re trying to persuade someone to give you money or be your friend is immaterial. 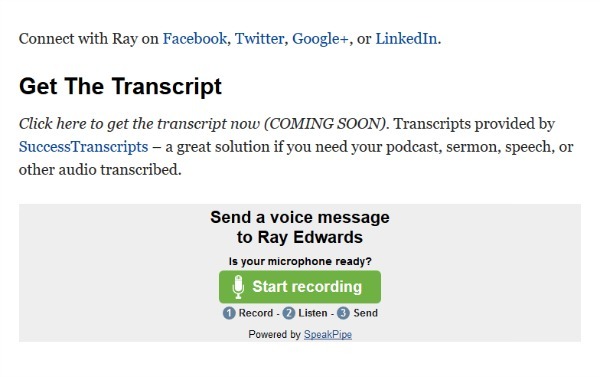 You can even communicate with Ray by voice message on his website. In business, the communication should either convince your audience that they can do something, or should do something. When you say you’re not a writer, I don’t believe you. And more over, neither does Ray. You don’t have to be a great writer to be a great storyteller. In fact, you don’t even have to write anything. You just read about the different opportunities you have to put the P.A.S.T.O.R framework into action. But anyone who says they’re not a writer is a liar. If you send an email, text, social media update, a birthday card to your mother, a letter to your lover, or a shopping list, you’re a writer. You physically picked up a pen, or put fingers to keyboard, and wrote the words. So saying you’re not a writer is just an excuse and not a very good one at that. But if you can write, you can learn to write words which will fill your pockets with money. 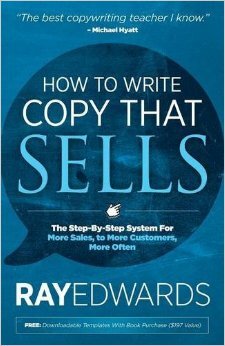 And that’s exactly what Ray Edwards does in his new book How To Write Copy That Sells. He provides you with a step-by-step system for making more sales, to more customers, more often. And isn’t that exactly what you want? With Ray’s help, you can learn to competently write copy that sells without being pushy. This is one of the best online copywriters teaching you his craft. I have no doubt that you can make back the small investment needed to buy the book, with the increase in revenue you’ll have as a result. Plus it contains information on everything today’s entrepreneur and marketer is likely to need. And as you’d expect, it’s full of brilliant writing as it guides you through the entire process. You’re bound to take something away from every page. 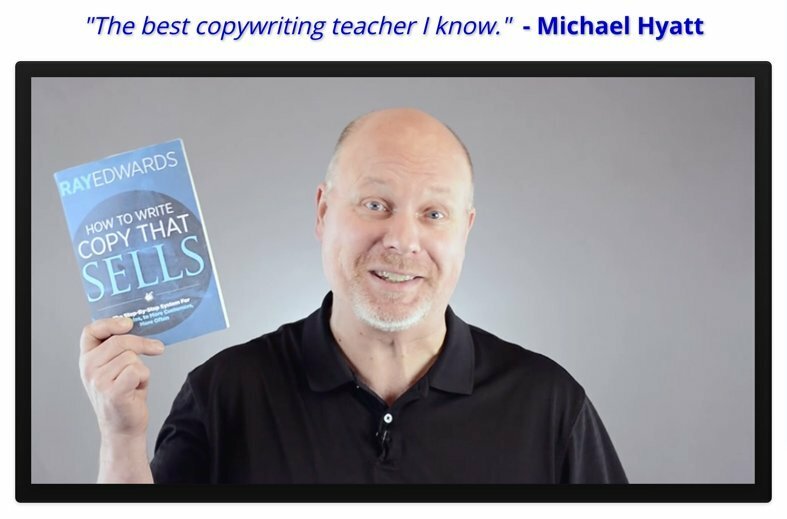 Don’t forget to let Ray teach you everything he knows by purchasing How To Write Copy That Sells from Amazon, as an ebook, hardback or paperback version. And best of all, it will cost you only a tiny amount of time and money compared to how much it cost him to learn it all. You can also listen to his weekly podcast The Ray Edwards Show. He uses his show to help you start, run, and grow your own Internet-based business, and interviews experts himself. Also, take advantage of all the free resources Ray has for you to use on his website www.rayedwards.com.